Now, I get it. You (presumably) like your friends and don't want to scream at them for the sake of enjoyment. Trust me, though. It's gonna happen, whether you want it to or not. 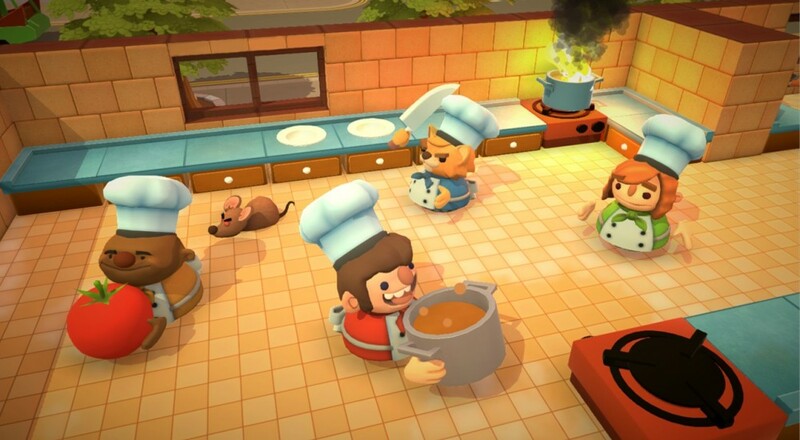 Let's say you play Overcooked with your pals, and a few levels go by without a hitch. You're slapping mushroom soup on plates, cleaning dishes, and keeping folks happy. Then, out of nowhere, the game wants you to start making fish sandwiches on top of the soups you've grown so used to. On top of that, your kitchen is now on a floating block of ice. All of a sudden, you've got an order that's about to run out of time and there isn't a fried piece of fish in sight and that's insane because why wouldn't your friends be cooking any fish and WHAT'S A GUY GOT TO DO AROUND HERE TO GET A GOSH DARN PIECE OF FRIED FLIPPIN' FISH AROUND HERE. Phew. Sorry, had to get that out of my system. Anyway, Overcooked is good. Like, really, really good. It's a relatively simple premise, but developer Ghost Town Games executes it to perfection. The physical edition, which can be purchased on PlayStation 4 or Xbox One for twenty bucks, contains the "Lost Morsel" DLC pack, an expansion adding six new jungle-themed levels and six extra chefs to choose from. It's also the only way to obtain said DLC pack before its digital release on November 15th. What's not to love? Get it. Enjoy its four player local co-op with your friends. And... I suppose try to keep the swearing to a minimum.